This exhibit will run January through December 11th of 2017. 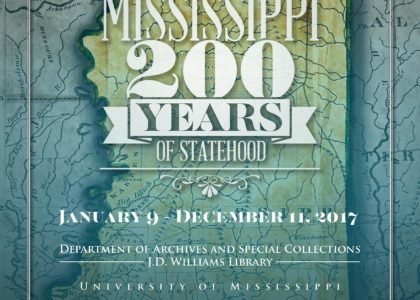 It is located in the Faulkner Room in Special Collections. The hours are 8am-5pm Monday through Friday (except for University holidays). Please call in advance, as the room is used at times for archival instruction. The number for the main desk is (662) 915-7408.